Thank you for checking my thread. I am hoping to get help with some optical calculations, for DIY lathe work to modify a darkfield (microscopy) funnel stop. I will gladly compensate the time required for such calculations. Thank you! Basically, the darkfield funnel stop works similar to an exit pupil after all lenses in an objective and it stops down the numeric aperture of an objective to produce bright subject image on black background. I would like to know what funnel opening size we should use, for darkfield NA 1.0, 0.92 and 0.83. The objective I want to work on is a LOMO water immersion apo 65x NA 1.1, which has no factory iris for darkfield (DF). Its NA 1.1 works, for some tiny diatoms in DF, with a NA 1.2/1.4 oil darkfield condenser, but that NA is too high for many thick subjects (I would get halos). I currently have a DF funnel stop, made by AO Spencer for a different apo objective (90x NA 1.4), that fits my LOMO objective and stops it down to around NA 0.7 (I have done careful diatom resolution test to come up with that NA value, its DF resolution is definitely less than NA 0.75 and slightly better than NA 0.65). But I want to increase the stopped-down NA back up to NA 0.83, 0.92 and 1.0, by opening up the current aperture. The DF funnel stop that I have is rare (I may not be able to obtain another one). My machinist friend, who has no microscope to check DF, is located in another state. So I would like to get accurate numbers as to how many millimeters we should make the funnel opening be (that way, we do not have to go back and forth). 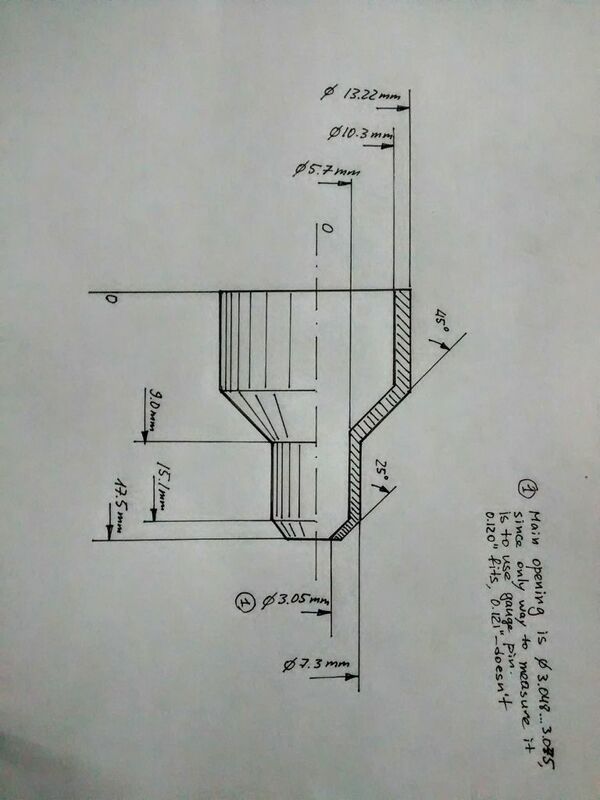 Pictures of the metal funnel is attached herein, along with a sketch. Its current opening size is 3.05 mm (for stopping down NA 1.1 to NA 0.7). The 65x NA 1.1 objective has 160 mm tube length (focal length is 160/65 = around 2.46 mm). It is 33 mm long (from thread to tip). The DF funnel tip sits 15 mm below the thread, while last lens sits 20-21 mm below thread (ideally they should be very close, like the other iris objective that I have). The objective has a rear diaphragm of around 7.8 mm diameter, sitting at 4.7 mm above thread (23.7 mm above the last lens). There is nothing else between the rear diaphragm and last lens. Please refer to the attached drawing for dimensions of the funnel stop. The narrow end of the DF funnel stop has inner aperture opening of 3.05 mm in diameter. The wider end has opening of 10.3 mm in diameter. 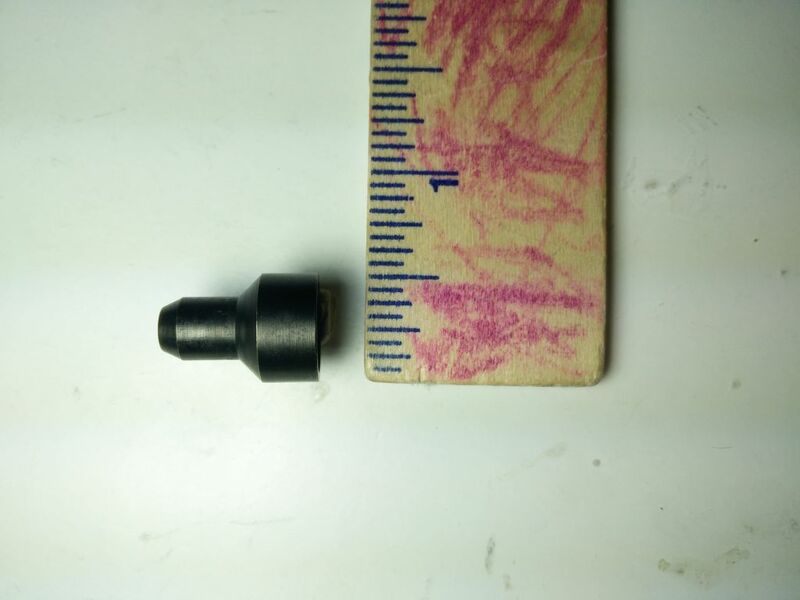 Our idea of modification is the open up the funnel stop from NA 0.7 (3.05 mm) to NA 1.0 (what ?mm). Then use a muzzle cap to stop it further down to NA 0.92 (?mm) and 0.83 ?mm). The wide end of the muzzle cap will snap onto the original Funnel's narrow end. The narrow end of the muzzle cap will be about 2 mm away from the rear lens. If cost is too much, we will only make one muzzle cap and pick NA 0.87 as stopped-down NA. 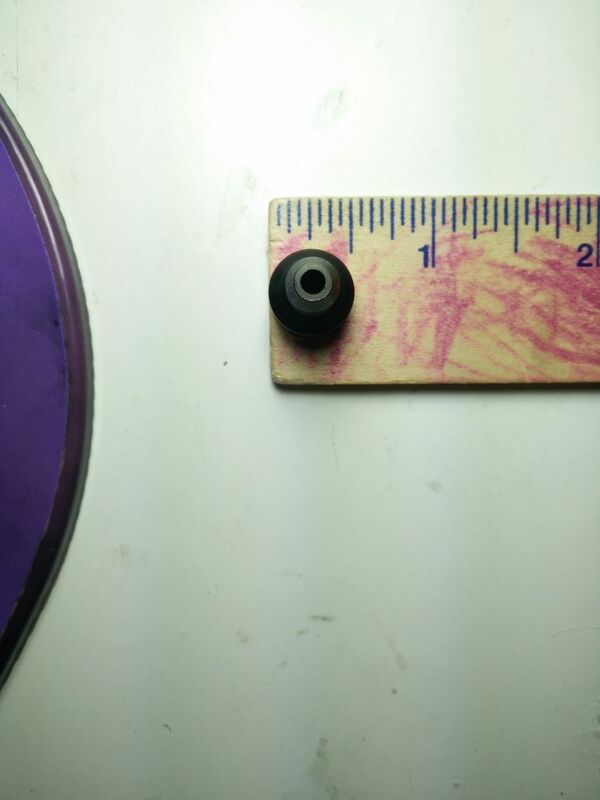 Again, muzzle cap end will be 2 mm from rear lens and we would like to know what diameter should we use there. I have a water immersion achromat objective with iris 30x NA 0.65-0.9. Its iris also works as an exit pupil. For this one, the NA vs aperture opening diameter relation does not seem linearly proportional. Iris setting at NA 0.65 uses an aperture of about 18 mm diameter, while NA 0.9 uses aperture of around 86 mm. Focal length of this 30x objective is around 5.33mm and it is again 33 mm long from thread to tip. Its iris sits at 13.2 mm below thread, while last lens sits at 13.6 mm below thread. The darkfield condenser that I use is a Bausch and Lomb paraboloid oil condenser, with light cone NA of 1.2-1.4. I am not aware of any other affordable DF solution for water immersion objectives. There are oil immersion iris objectives, but I do not want those. Alternative option is to use a LOMO 85x NA 1.0 achromat water immersion objective that costs around $80, but I prefer to use the apo objective that I already have. My machinist friend will use a precision manual lathe with collet holder, which allows concentricity within about 0.01mm. He will use some small reamers and drills for the work. I am not at all confident that I understand this problem. But since nobody else has responded, let me tell you my thoughts. First, by my understanding the stop diameter definitely should vary linearly with NA. I can't even make a good guess about why that is not the case with the adjustable objective you measured. This calculated value of 0.60 is slightly lower than the minimum value of 0.65 that is determined by your resolution measurement. The discrepancy is not large enough that I would rule out measurement error, especially given the difficulties that I've seen in measuring resolution even with simple subjects like ruled charts. But it is certainly enough to erode confidence in the calculation. Again, I have to emphasize that I have no hands-on experience with this problem, and no way to confirm any of the calculations except what I've described above. If there appear to be mistakes, or if you learn other information that relates to this problem, I would like to know. Thank you very much! I feel fortunate to have your kind help. I think your calculation result of NA 0.6 makes more sense, based on your formulas and what I know about that darkfield funnel. That darkfield funnel was made for an 90x oil apo with original NA 1.4. I know for a fact that AO Spencer made darkfield funnel to stop down to DF NA of around NA 0.85. Going by your formulas and my mesurements on the LOMO objective (with slight length mismatch), that funnel would give 90x objective a DF NA of 0.83. That is probably as close as it can be to the factory setting of 0.8-0.85, considering the slight length mismatch. Using my mistaken estimation of NA 0.7, that funnel would give an impossibly high DF NA 0.97 for a 90x objective (they should not set it that high for general DF use). Even NA 0.65 estimation does not make sense either (DF NA 0.9 is still too high for a safe factory setting). My visual estimation of NA 0.65-0.75 was only based on diatom dot/line resolution, examined by my eyes, compared to NA 0.65 and NA 0.75 objectives. There was my psychological bias mistakenly favoring the 65x apo too (one side of my mind whispering to my ears "immersion apo should resolve better than dry achromat, stopped down or not"). Also, I was wrong for saying that my iris 30x NA 0.65-0.9 objective does not have stop diameter that varies linearly with NA. I confused half way of the iris wheel travel (which does not seem to produce a middling stop diameter) with a middling NA of 0.78. Excellent, this further information seems to resolve the inconsistencies that were bothering me. Thank you so much, Rik. I apologize for the confusion caused by my mistaken estimation. Next time, instead of using subtle language like "it seems.....", I would just say " my likely mistaken guess is.........." That way, people would know not to take my guess seriously there. No worries! I think I understood the situation pretty well, and it wasn't like I was agonizing over the discrepancy. If you're looking for a more neutral phrase, perhaps something like "by visual estimation" would convey less certainty without going all the way to self-deprecation. My machinist friend has been busy, so I did an experiment to compare the effect of stop location on darkfield image quality. I made a rear disc diaphragm myself, out of aluminium sheets, to stop down a 40x NA 0.95 apo objective to around NA 0.82, at 145 mm from image plane. The NA 0.82 turned out to be a good comprise between NA 0.95 and NA 0.65, as it significantly reduced (out-of-focus) halos of the NA 0.95 and provided better resolution than NA 0.65. The alternative way to place the stop is using a funnel stop at around 165 mm from image plane. Rik told me that this placement may produce better image, as more of the lens center is utilized (than the 145 mm placement). Unfortunately, my 40x NA 0.95 objective has an complex internal structure and does not allow internal funnel. Although my water immersion 65x NA 1.1 objective can accept internal funnel, which we are going to make. As a side note, the magnification in Rik's formulas refers to only objective magnification, so eyepiece magnification does not matter for those formulas. I will update this thread, once we make and test the funnel stop. My machinist friend made me those darkfield funnel stops, based on Rik's calculations/formula. Using those custom darkfield stops and mounted diatoms, I can visually see the difference between immersion objective NA 0.87 vs NA 0.95, and dry objective NA 0.95 vs NA 0.85. Difference is there, though not a lot. Difference is more significant between immersion objective NA 0.87 vs NA 1.1. If any microscopist wants to make similar custom darkfield stops, (s)he can message me and I will refer my machinist friend to you. I suggest reading this thread yourself and come up with the exact stop diameters though, before contacting my friend (he is not a microscopist). This is good to hear. Thanks for reporting on the final result. You can count on me on reporting back results. I always consider that my responsibility, once I ask a question and get an answer/advice. I have seen people who wrote down a question then disappeared - I cannot say I like that.